Good lord we’ve had (almost) an entire week without Brexit chat. Yes, it’s cost us £55bn via a giveaway Budget to make it happen – but frankly that feels like money well spent (especially the £1.7bn going back into Universal Credit). Our gratitude to the Chancellor has however been severely tested. No, not by the ludicrous £1.8bn tax cut (half of which goes to the top 10 per cent) or by some simply awful jokes, but by something much much worse – delivering his Budget speech at 3.30pm rather than the normal kick-off soon after midday. This might sound innocuous, but taking away those three hours is an act of pure evil for those of us trying to deliver you a proper analysis of the Budget. You wouldn’t have wanted to have seen the overnight scenes in RF towers. By 4am it was a lot like a Die Hard movie. Just with more spreadsheets. And less AK47s. But we’re not bitter. Not at all. Anyway, onwards and upwards to this week’s film title related reading. i, Robot. There’s lots of chat about robots taking our jobs, with ever more complicated ways of showing which jobs are most at risk from automation. But too often all this work ignores the importance of human preferences – what they do, and don’t, want robots to be doing. This, in the end, will determine what robots actually end up doing as much as the technology itself. A YouGov poll released this week digs into this emotional side of things and suggests that robots might not take all our roles even if they manage to snaffle a job or two. We’ll still be friends or partners it appears – with only 2 per cent of us being able to ‘definitely’ imagine ourselves forming a friendship with a robot in the future. 75 per cent say they’d ‘definitely not’ imagine having a romantic relationship with a robot (though probably more worryingly 5 per cent are willing to consider it). On the job front 70 per cent of us would be uncomfortable having a robot manager – although they can’t do much worse than British ones. The young old Karl Marx. You couldn’t make this up. The White House Council of Economic Advisers have issued a detailed report on… the evils of socialism. It puts project fear around Brexit to shame – concluding that having a taxpayer funded health system would shrink GDP by 9 percent – that’s 50 per cent bigger than the GDP hit the UK saw after the biggest recession in living memory in 2008. So now you know, Scandinavia = bad. Chart of the week. Amid the big headlines and high politics of Budget speeches lots of micro policies get missed (see for example, lifting the HRA cap for councils). We’ve heard a lot about the end of austerity this week, but the Chancellor also dropped in a rather small new ambition – to ‘end low pay’. This definitely shouldn’t be ignored. Philip Hammond has in mind further big rises in the National Living Wage after it reaches its current target of 60 per cent of typical wages in 2020 – potentially rising to 67 per cent. That would be a big deal, as our chart of the week shows, taking our minimum wage rate to one of the highest in the world. There’s some politics going on here as well – this proposal would mean the Conservatives arguing for a minimum wage nearly as high as Labour are calling for (£10 in 2020). There are definitely risks with these kind of approaches. However, taking some risks in the name of increasing wages of the low paid is sensible – so long as it’s done in the right way (as we’ve set out). Notes: All figures excluding the four UK scenarios are taken from OECD statistics, with data for 2017 or latest year. The ‘UK NLW today’ is calculated using the current NLW of £7.83 and median full-time hourly earnings from April 2018. The bite for ‘NLW in 2020’ is calculated using the OBR’s projections for the NLW in 2020 and median full-time hourly earnings excluding overtime in 2020 terms using OBR’s assumptions for average hourly earnings growth. 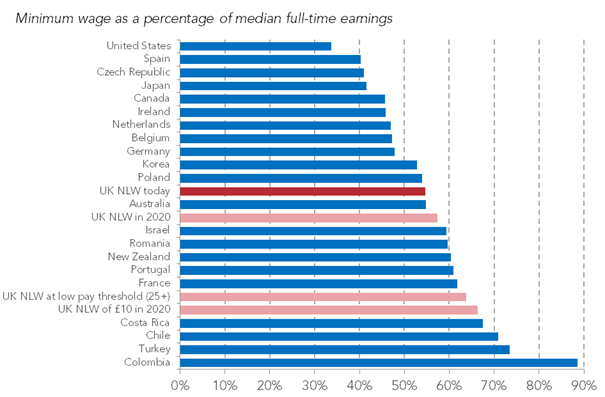 ‘Low pay threshold (25+)’ is calculated by taking two-thirds of median earnings for all employees in 2018, multiplied by the difference between the all-employee and 25+-employee medians in recent years, over the full-time median in 2018. ‘£10 in 2020’ uses the same approach as ‘NLW in 2020’. Each of these scenarios are indicative with uncertainty over future wage growth and the relationship between the median earnings of all employees, full-time employees and those aged 25 and over.